Treasure Chest - a voice of New Life Church in West Linn, Oregon: Awana Begins! Awana began this past Wednesday with lots of excitement. Five Cubbies (3-5 year olds) and five Puggles (2 and 3 year olds) officially began their Awana adventure of singing songs, playing games, hearing Bible Stories, and memorizing Scripture. 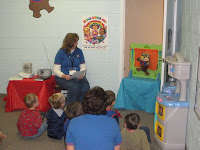 The Cubbies get to see a special puppet show each week featuring Cubbie Bear and his friends. This week they are memorizing the Cubbies Motto: Jesus Loves Me and other Bible verses. Each Cubbie lesson is very intentional about sharing the gospel. 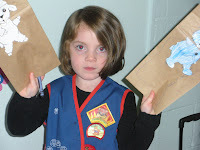 Then, parents have the joy of discipling their own children throughout the week using their child's Awana Handbook. The Puggles have lots of play time, hear short Bible Stories, and get to see Boz videos (a cute little green bear who lives out the truths of the Bible). They also have special multi-Color take home cards that reinforce the lesson and help parents talk to their children about simple truths from the Bible. We are having so much fun in Awana and would love to have any children you know in these age groups come and join our club. Remember, the start of Sparks (K-2nd grades) and TNT(3rd- 5th grades) is just around the corner on Jan 6th. For more information about Awana please contact Sara Pylate at sarapylate@juno.com or 503-699-2027.